Got the sniffles? Achey from over-doing it? This all-purpose medicated salve relieves cold and flu symptoms and eases muscle aches. Regenerates damaged skin from rashes, cuts and burns too. 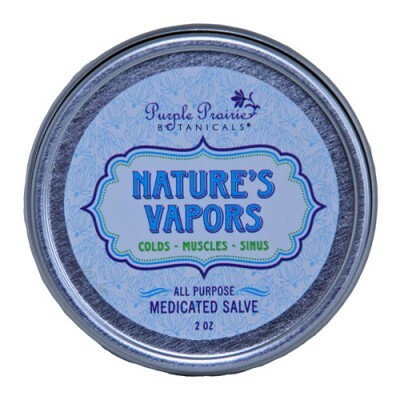 An essential salve that does it all! 2 oz. tin. 100% natural. EWG Rating is a 1. "Not sure? Try a Sample." Aromatherapy Benefits: Antiviral, Antiseptic, Decongestant, Sedative. Directions: For chest colds, nasal congestion & flu symptoms: Massage salve on temples, under nose, chest and feet (cover with socks). For sore muscles and skin ailments: apply directly to area. 100% Natural Ingredients: Organic olea europaea (olive) fruit oil, cera alba (beeswax), organic helianthus annuus (sunflower) oil, cinnamomum camphora (camphor) oil, eucalyptus globulus (eucalyptus) leaf oil, zingiber officinallis (ginger) essential oil, lavandula angustifolia (lavender) essential oil, mentha piperita (peppermint) essential oil, rosmarinus officinalis (rosemary) essential oil.